West Coast Property Management Galway. We are a well established Property Management and letting agent who provide a professional and comprehensive service to all our clients. West Coast Property Management are located in the heart of Galway City and have a proven commitment to excellence. 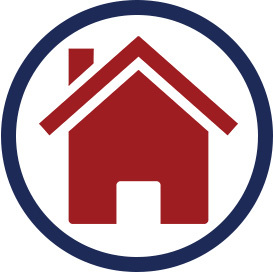 We are focused solely on residential lettings and management, so we can devote 100% to taking care of your property. This is why we are one of your best choices when in need of a good letting agent in Galway. Our business philosophy is built around providing the highest level of customer care. We are always striving to exceed our customers’ expectations and be the best letting agents Galway has. When we receive an instruction from a property Owner to rent their property we advertise the property free of charge. We operate a “No Let No Fee” policy. West Coast Property Management Galway recognizes the high levels of service that are required. We have invested significantly over many years in the latest technology to provide our customers with the most accurate and meaningful information available. We understand the value of relationships. We insist that our management team and staff are completely accessible. We fully understand our client’s demands and strive always to meet their expectations. We listen. We are responsive to what our customers require in an ever changing market place. We deliver workable solutions and advice whenever it is required. Our primary concern is always our clients and maintaining their property to a high standard whilst minimizing expense. 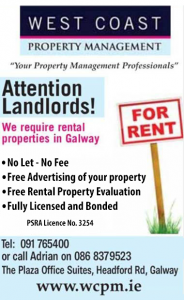 For any additional information that you may require, please feel free to contact West Coast Property Management Galway.